Is This on the Top of Your List of Things to be Thankful For? With the holidays approaching, our thoughts often turn to all we have to be thankful for. We sure hope you have more than you need and everything you want. But if you’re still searching for your number one most favorite thing to be thankful for this season, we have two words for you: Central. Heating. In case you can’t remember a time before this wonderful invention, (or you have chosen to forget such a time existed,) we would like to present you with a list of the reasons why we are thankful for central heating. 5. Late Night Television. How many of your favorite television shows don’t begin until after 9pm? 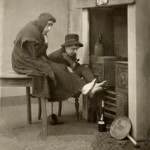 Before central heating became the standard in American homes, you would have been forced to retire much earlier to stay warm. 4. The View. Not the television show, the actual view outside of your windows. Without central heating, the windows in cold rooms would freeze over from the inside- making it difficult to look out. 3. Privacy. Many homes utilized a single fireplace to heat the main living area. This meant that if you wanted to stay warm while dressing, you would need to do it in front of the fire. 2. Open Floor Plans. Before the adoption of central heating, homes were built with smaller rooms often around a radiant heat source, like a fireplace, to conserve heat. 1. Home Décor. Heavy carpets, rugs and curtains were preferred over bare hardwood, blind and laminate or tile flooring for their superior ability to retain heat. Now we have the option to choose materials based on our personal style versus degree of warmth. We hope our list inspires you to create your own. And we hope your furnace gives you much to be thankful for this winter. If that’s not the case, we hope you will call.